Barnett - THE MASSACRE AT LE PARADIS - HELL IN PARADISE - MAY, 1940. 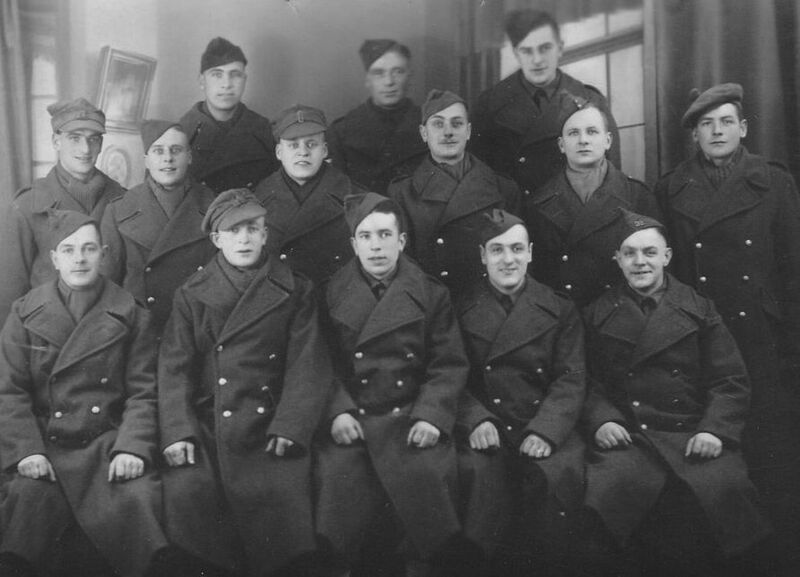 Prisoners-of-war from Stalag VIIIB - working party E261. Vic Barnett is middle row second from left. The camp was situated at Lamsdorf in Silecia. 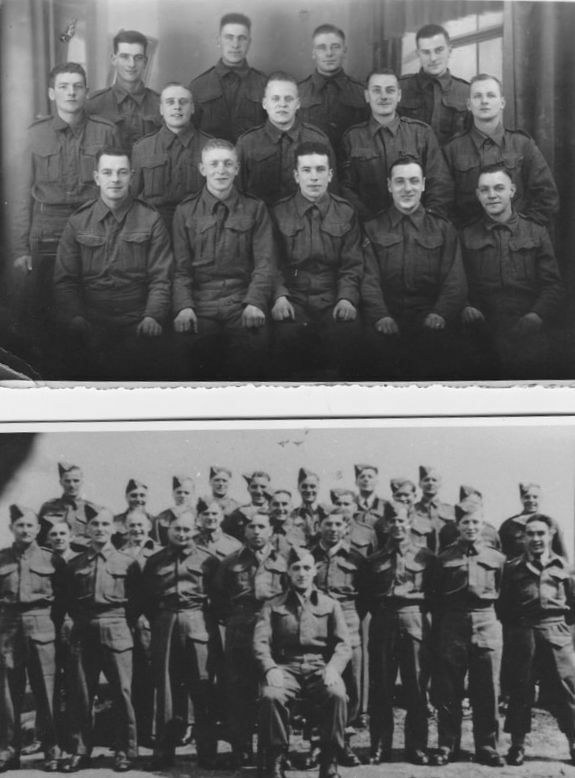 Vic pictured on the left in January 1940 and on the right in February 1940. ​Prisoner-Of-War 12th June, 1940 to 15th May, 1945 - Prisoner No 6947. In 2017 we were approach by Mr and Mrs Graham Hunt who advised us that that the ‘Vic’ referred to on pages 83 and 84 of the book "The Vengeance of Private Pooley" by Cyril Jolly was their uncle Vic Barnett. 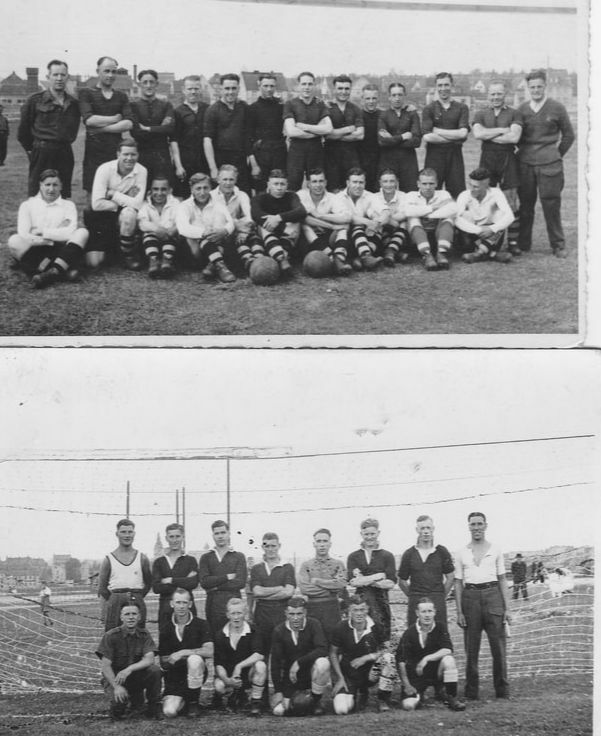 On June 22nd 1940, Bill O’Callaghan, then a prisoner of war, leaving the seriously injured Bert Pooley behind, left Bethune Hospital to meet up with many other prisoners of war at a football stadium in the town. "As O’Callaghan scanned the faces of the passing men he suddenly shouted with surprise and pleasure, for there among the hundreds of strange faces he saw Vic, an old school mate from his home town. Vic heard his name shouted and after a momentary puzzled look he recognised O’Callaghan. O’Callaghan thought that his own brother was also in Vic’s battalion so he shouted, asking if he had seen him. The other man from Norfolk bellowed back above the crunch of marching feet that he had not, but that there were several men in the column whom O’Callaghan would know. So Vic passed on, and he stood eagerly scanning the ranks of wounded, dirty, tired and hungry men – the captured men of the 51st (Highland) Division that had been trapped at St Valery. He watched until his eyes ached and his head swam, but he saw only four men whom he knew and none could tell him of his brother." Vic Bartlett was captured at St Valery on 12th June, 1940. As a member of the 7th Battalion The Royal Norfolks he, together with other units, were attached and under the command of 51st Highland Division. Initially stationed on the German French border (Saar Force) they received orders to move to St Valery on June 11th, 1940. They were the last complete division remaining in France and were not evacuated from Dunkirk but under heavy attack withdrew to the beach of St Valery-en-Caux to await rescue. In a complete debacle no vessels came to rescue them neither was there food and ammunition. 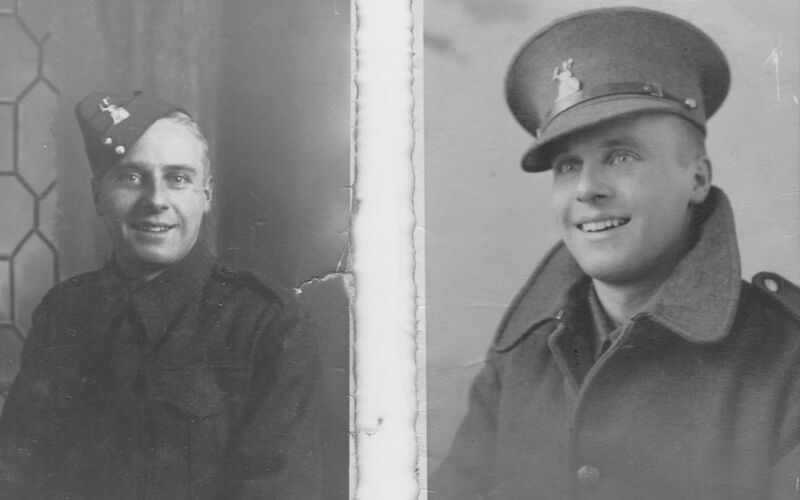 Bill O’Callaghan and Vic Barnett returned from being prisoners of war to spend the rest of their lives in East Dereham, Norfolk (see Bill’s Biography). Vic was a lifelong member of the Dunkirk Veterans' Association and completed 60 years as a member of Dereham Band. 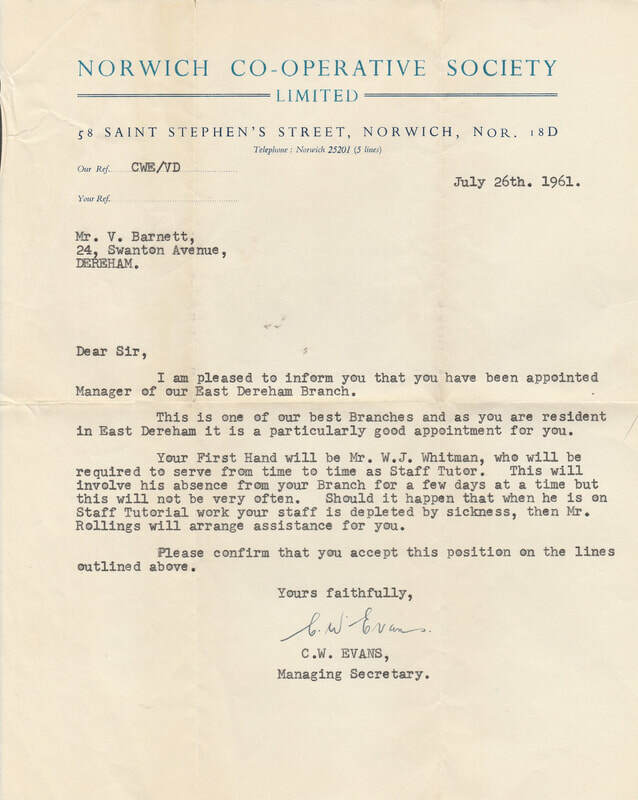 He was a member of the Union of Shop, Distributive and Allied Workers and on July 26th, 1961 was made manager of the East Dereham Branch of the Norwich Co-Operative Society Limited. The photographs above come from Vic's box of memories which he kept and which are now owned by Mr and Mrs Hunt. 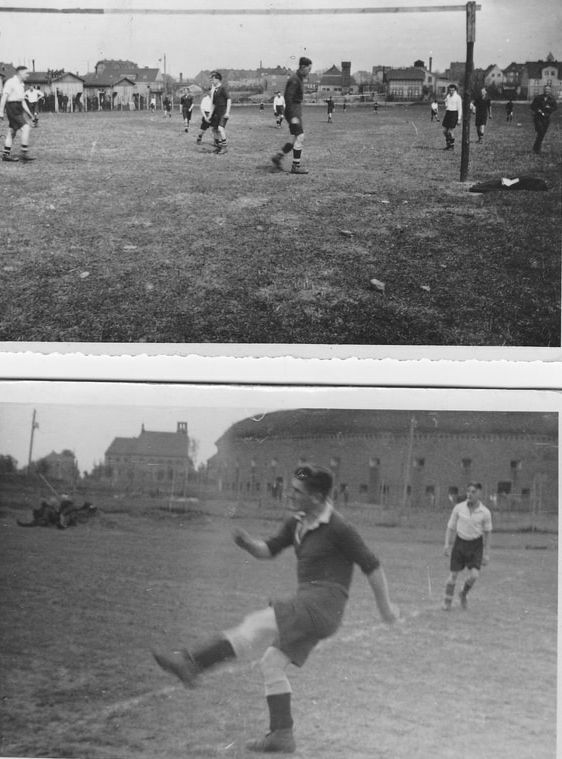 They show football matches and teams from Stalag XX1D and may include Vic. All photographs are courtesy of Mr and Mrs Graham Hunt and used with their permission. The photographs below are more pictures taken from the prisoner of war camps. The top one is again of Stalag VIII B/E261. Stalag XX1D was in Poznan, Poland. 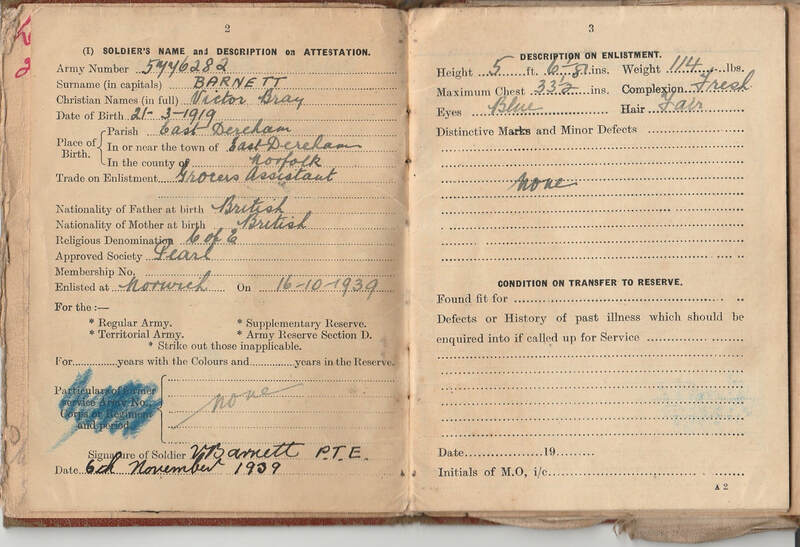 Top left to right - Appointment as manager of East Dereham Co-op, soldier's pay book, soldiers service and pay book. 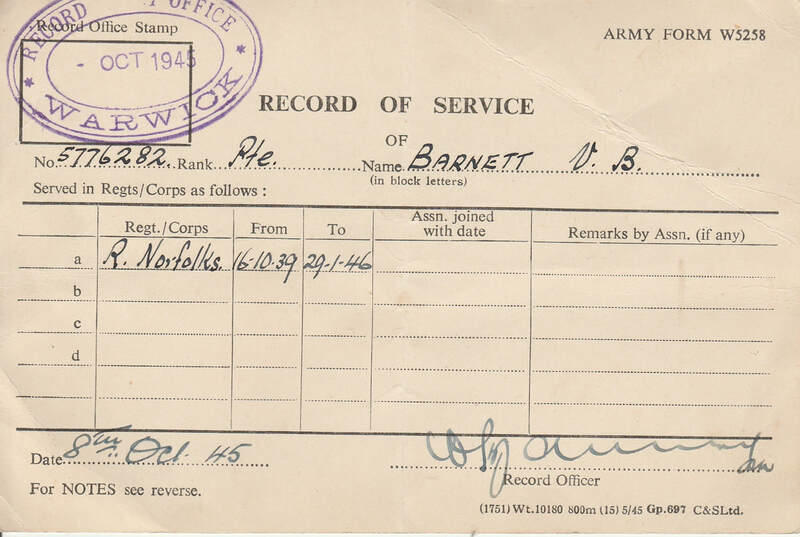 ​Bottom left to right - Record of service and discharge from the army certificate.